Fefoo is not another search engine but it works with the existing search engines and gives the ability to search more effectively. http://fefoo.com/ is like a directory of search engines. Search engines are sorted according to categories which makes it easier to discover things. With fefoo you have more than 40+ search categories and 250+ search engines on your fingertips. When you look at the fefoo homepage it looks like most other search engines. The main difference is that when you start searching you can choose the category that you want to search on. This makes it possible to target your search without remembering specific websites. It acts like bookmark for search engines. The homepage has been specifically designed to open in less than a second even on the slowest possible connection. (The first time you visit fefoo it might take a few seconds but after that it will never take more than a few milliseconds to open). The first time you visit fefoo, you will only see the top ten categories. You can add or remove and select which categories are visible. There is a very diverse choice of categories from Blogs, Books, Encyclopedia, Finance, Health, Images, Jobs, Music, MP3, Movies, People, Recipes, Real Estate, Shopping, Sports, TV, Torrents, Video to name a few. When you search based on a category, you are shown the results and you can refine your search or choose another search engine if you don't find what you are looking for, using the quickbar on top. Though having 40+ categories and 250+ search engines is great but it also makes it challenging if you like using the keyboard. With commands you can target all the the categories and search engines. To use a command : (colon) is used. To search for images use the following command. This will search for "images" of clouds. This way you can end up targeting any of the 40+ categories supported by fefoo. You can use the name of a category or directly a name of a search engine. This will search for "fefoo" on twitter. Using a name of search engine you can target the 250+ search engine. Once you start using commands you will notice that you don't need to type the complete name of a search engine or category. You can use short hand commands. This will search for "images" of cats. When you begin you search with a : (colon), you move to the command mode and you can see what category or search engine will be used. As soon as you see the name of the search engine or category you can stop and type in your search query. The short hand commands can also be used to target all the 250+ search destinations. In this example we search for images of clouds on flickr. You don't need to remember the short hand commands, as soon as you type :fl it shows you that it will search for images on flickr. You can stop typing the command and enter your query like we search for "clouds" in this example. Using short hand you normally don't have to type more than 2-3 characters to target a category or search destinaton. Here is a list of commonly used shorthand commands. When you use the : (colon) command you will see the toolbar on top. You can use a ; (semicolon) instead of the : (colon) and it will turn off the toolbar and directly show the results on that search engine. In these examples you are directly taken to the results page. 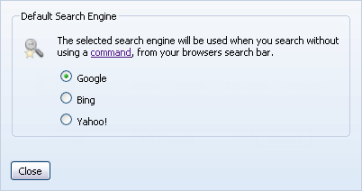 If you use Opera, Chrome, Firefox or Internet Explorer you can add it as a search provider. 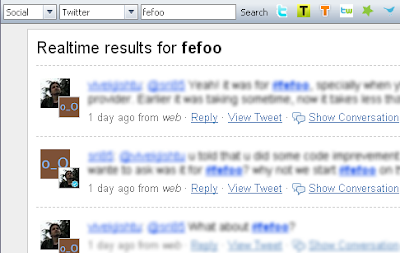 Since most people search from the search bar it makes the most sense to add fefoo as your search provider. It has been specially designed in a way to enhance the way you search. It does everything that your current search provider does plus a lot more. When you add fefoo as a search provider it will work exactly like your current search provider. Only when you use the commands will you see the real magic of fefoo. It works completely transparently without adding any overhead to your search. You can open the Settings from the homepage and select which search engine you want to use when you don't use any command. Fefoo has been heavily optimized to add almost no overhead since everything is done on your browser. Once you add it as a search provider you can use all the commands from the search bar. This opens up a whole new world of possibilities, you can search on all the categories and 250+ search engines from the search bar. Commonly used search on Twitter, Flickr, Wikipedia etc. can be done in a fraction of a second. Also make sure to read about the tools category that enables you to perform many commonly used tasks from the search bar. 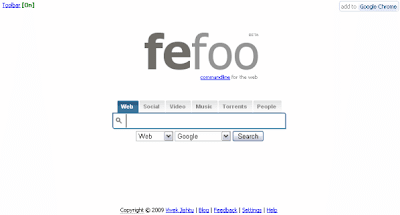 To add fefoo as a search provider click on the Add to Browser link on the fefoo homepage.